Capital Cities USA Journey Across America | Am I Blue? 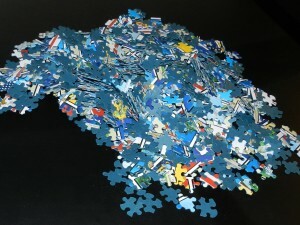 The puzzle pieces sat in a pile for several days, as I half-heartedly tried to sort blue from blue from blue. After brother left, I raked everything back into the box and headed for my sewing basket. Being heavily dependent on Excel spreadsheets to help me organize almost everything in life, I grabbed a spool of thread and the scissors and with a little Scotch tape turned the card table into Columns and Rows. 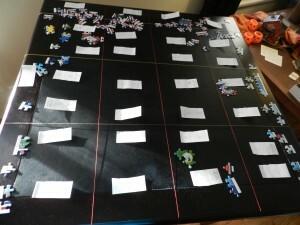 Then I put Post-Its into each section marking which state fit where. Aha! I dug into those thousand pieces again looking for words. “Mon” went into the Montana section, “sas” into the Arkansas slot; I was on a roll! How many flags have outspread eagle wings? Just two – Iowa and North Dakota. Plop plop. The palm tree went to Hawaii; the horses to Pennsylvania, the bison belonged to Wyoming. The challenge began to be fun, and (with magnifying glass in hand) I began to notice the details within the flags. I didn’t expect to have a learning experience, but that is exactly what happened. In my two-year Journey to 50 states, I didn’t pay much attention to the state flags. But suddenly I realized that flags are the story-telling devices of the state. And I love a good story! Thirteen state flags have people on them, two have bears, seven have eagles, twelve have stars, three have sailing ships. How do those icons reflect the history of the state? A number of flags have plowshares, or swords. Oregon has a covered wagon, Oklahoma has eagle feathers and a peace pipe, Hawaii has the Union Jack, all symbols of settlement, and change. But let’s go back to colors, and those four non-blue flags. 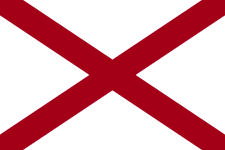 The Alabama flag is red and white, or as described, “the crimson cross of St Andrew on a field of white.” The story behind that is a battle story, a Civil War battle story to be exact. An Alabama legislator, John Sanford Jr, proposed the design in 1895 based on a flag used by his father’s regiment, the 60th Alabama Infantry, during the Civil War. The regimental flag was used in various configurations throughout the war and finally surrendered at Appomattox Courthouse. California’s Bear Flag is a kind of battle story too, its fiery red star and giant hulk of a bear representing independence and strength. 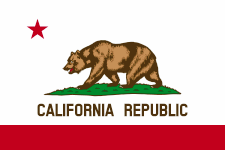 Today’s version carries one red star as well as a red stripe; a brown bear walking on green turf dominates the center, with the words “California Republic” below. Study California history from Spanish provincial times through Mexican rule to statehood to understand the significance of those symbols. The model for the bear depicted on the current flag was a big fellow named “Monarch.” He was captured in 1889 and lived for a time in the zoo at Golden Gate Park; after his death he was mounted and preserved. Maryland’s flag is a combination of two coats of arms; the black/gold of the Calvert line and the red/white of the Crossland line; there’s an extended history lesson back of that, a kind of Hatfield-McCoy tale. 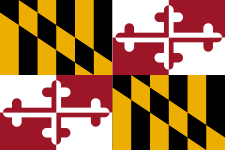 Begin with the Calvert who founded the Maryland colony, and his coat of arms (the black and gold one) which made an early flag; add in his paternal grandmother’s coat of arms (the red and white one), and move forward to the Civil War. Maryland remained with the Union, officially, but many supported the Confederacy and fought with Lee, adopting the red and white Crossland banner. Reconciliation after the war brought the two together, with each coat of arms claiming equal space on the flag, officially adopted in 1904. 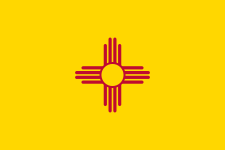 New Mexico’s flag, with a red Zia sun symbol centered in a field of yellow, represents both the state’s Pueblo and Spanish heritage. And incidentally, that’s the state I finished first in the puzzle; those brilliant yellow pieces seemed to jump right out of the box. The North American Vexillological Association, an organization dedicated to the scientific and scholarly study of flags, claimed the New Mexico flag as the “best designed flag of any US state, territory, or Canadian province” in a 2001 survey. It is both simple and eyecatching, and school children in New Mexico recite a pledge to it after the US pledge of allegiance – “I salute the flag of the State of New Mexico and the Zia symbol of perfect friendship among united cultures.” The Zia sun symbol has a sacred meaning; the Circle of Life in the center is surrounded by four sets of four lines representing the four directions, the four times of day, the four stages of life, and the four seasons. It took me nineteen days to finish the puzzle, focusing first on words, then specific details, and now and then, colors. The Washington state flag is primarily green (it is after all the Evergreen State), with George Washington’s face set within a light blue circle; that one was pretty easy. The Tennessee and Arkansas flags are mostly red and Illinois and Massachusetts mostly white; the sections began to take shape and Texas and Wyoming filled the two bottom corners. The very last piece of the puzzle went to Alaska. And what color is that flag? Blue. I’ll be adding flags to the capital cities pages, so watch for those in the future, and at least 50 good stories. Meanwhile, try a puzzle yourself. 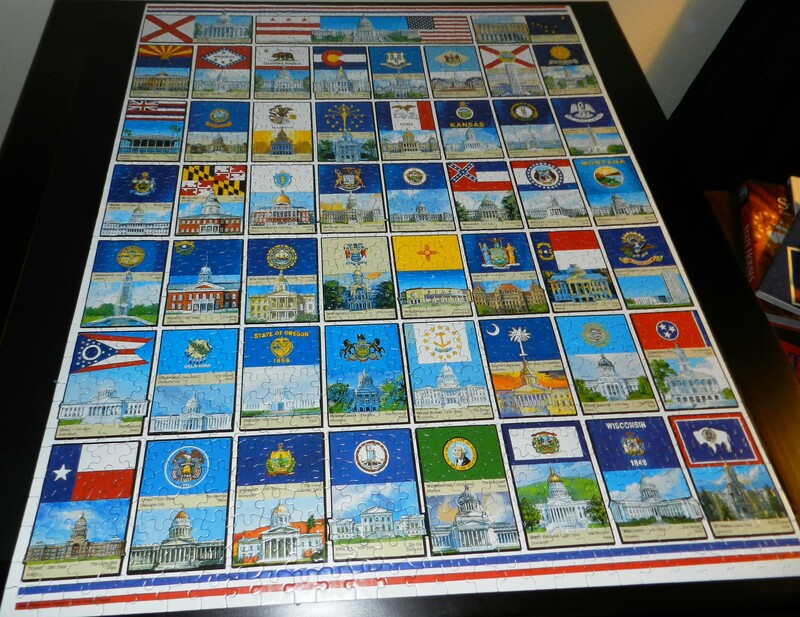 Description: All fifty state flags and capitol buildings, including the American flag and our nation’s Capitol are featured on this elegant puzzle. Every flag is up-to-date. Nicknames of each state are noted, along with names of capitals and their entry date into the Union. Which was the last state to enter the Union? Which one is considered the first? Artist: Ernest O. 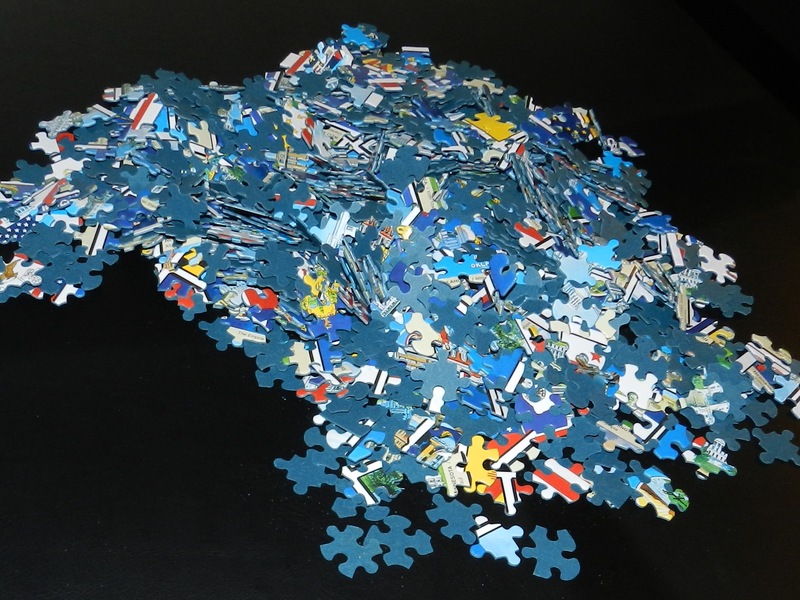 Brown: 1000 piece jigsaw puzzle: Finished size 24″ X 30″. 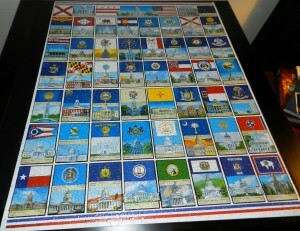 They’ve also got White Mountain puzzles with the US Map, state license plates, and best places to visit. Not a bad way to spend the winter months.